Your favourite Family magazine which completes 8 years in December 2009, is back after a gap of two months. I am happy to announce the 55th issue of the family Newsletter. As in the last two issues, there is a Tamil section (தமிழ்ப் பக்கங்கள்). The two big news items in the last two months were the wedding of Arun and the Dwithiya Ayush Homam of Shubha. Radha has written an excellent article All About Arun's Wedding (with photos by me) on the former while the latter is covered through photos. 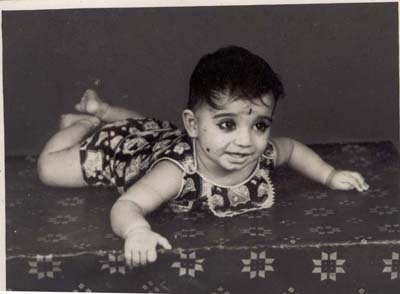 There are three other contributors from the family - Prasad, Kannan (Narasimhan) and Kausalya. Kannan continues to educate us on the work of the great Tamil poet Kamban. His article Appreciating Kamban --- An Enjoyable Encounter describes the meeting of Guhan by Rama and Lakshmana as well as the visit of Bharatha to the forest. Prasad's article, Mumbai Medley on some of his experiences in Mumbai during the two months he stayed there is as always interesting and highly readable. As one who is nostalgic about Mumbai, I enjoyed his article. I am reproducing Kausalya's article In queen’s land about her visit to Palace of Linlithgow where Mary, Queen of Scots was born. The Tamil section contains a few interesting articles. I had mentioned earlier that one of the best current writers in Tamil is S.Ramakrishnan. I am reproducing his article on Kodaikanal lake titled விழிக்கும் ஏரி. A lot of bloggers in Tamil hsve amusing pen names. A piece on this is இந்த பிளாக்கர்கள் தொல்லை தாங்க முடியலப்பா! A news item on the transplantation of the world's oldest potted plant can be read in தொட்டி மாறிய 234 வருட தொட்டிப் பனை! Are Indians as enterprising as the Americans or the Chinese? Yes, says Vivek Wadhwa in his interesting article . This article from The Economic Times has been reproduced in the section 'FROM THE NET'. This section contains three other interesting pieces - An interesting abbreviation, Etiquettes of eating Thayir Saadham and Art with Clouds. There was no time for making Sudoku. However I am reproducing a Tamil crossword (with hints for solving) compiled by Amritha and me for Kurukkum, Nedukkum, a Yahoo group devoted to Tamil cryptic crosswords. All the other usual features, viz. 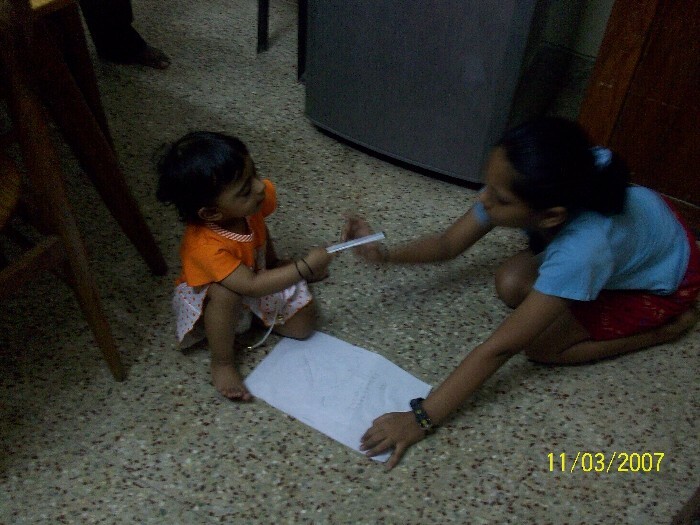 Memories are made of these, Important family events, Brain Teasers and Cryptoquip are there. Enjoy the Newsletter and do write about it. 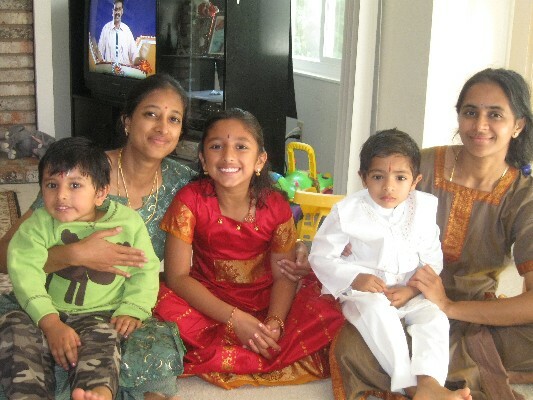 *** In a few hours, Amritha, I, Hema and Rukku will be leaving for Singapore and Sydney. We shall spend three days in Singapore and about 50 days in Sydney and will be back on 16th January 2010. There will be a big family gathering in Sydney as Mukund, Prema, Keshav and Shriya from USA will join us for about 15 days from 28th November to 12th December. Raghu and Chandra have meticulously planned our trips in and outside Sydney. We are eagerly looking forward to the trip. 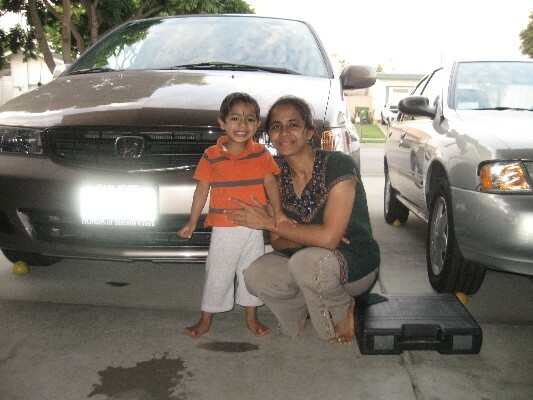 *** Shubha, Archana and Harish arrived in Chennai on 5th September. Harish joined duty in Bangalore leaving Archana and Shubha in Chennai. He occupied a serviced apartment <.i> from 17th September to 16th October. Archana and Shubha joined him a few days later. Amritha and I visited them for a few days before Deepawali. All of them (and Aarthi) came here for Deepawali. From 1st November Harish has taken a spacious flat in Indira Nagar on rent. He moved his luggage from Chennai on 7th November and they are settling down. Shubha has kept us busy and happy for the last two months. Shubha celebrated her first Deepawali in India in our house on 18th October. After breakfast, we had all gone to the temple on Deepawali day. The place that most attracted Shubha was the corner of Anjaneys sannidhi where Kungumam is strewn by the devotees. The photo of Shubha with a lot of Kungumam on her forehead was taken after our visit to the temple. We celebrated her second birthday on 22nd October (according to Tamil calendar) with an Ayush Homam in our house. On November 12th, Harish and Archana hosted a birthday party in Ballal Residency, a hotel in Bangalore. 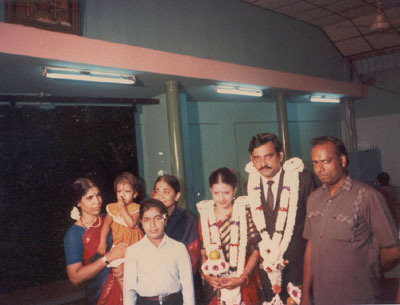 Amritha and I went to Bangalore from Delhi on 11th November after attending Arun's wedding. 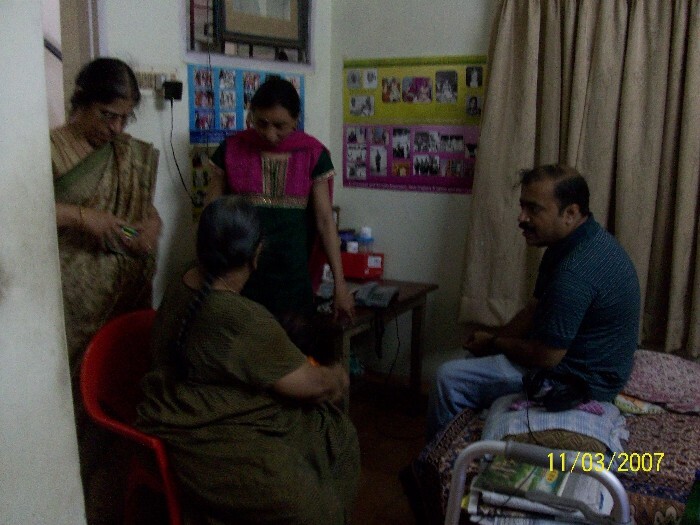 On 14th November, we all (including Archana's parents) went to Tirumala for Shubha's tonsure. Photographs of all these as well as photos taken in Harish's apartment in San Jose before they left for India can be viewed below. The first 3 photos were taken in San Jose in September 2009. 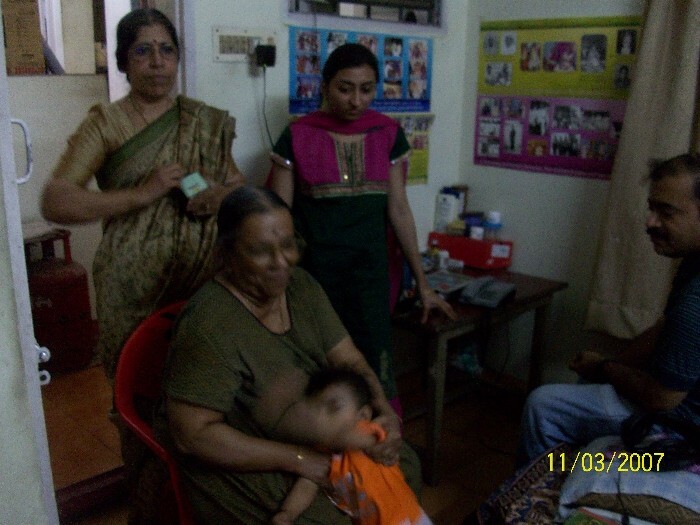 The next 7 photos were taken on Deepawali day on 18th October 2009. The next 23 photos were taken during the Ayush Homam on 22nd October 2009 (which also happened to be Archana's birthday). The next 6 photos are of Shubha's tonsure in Tirumala on 14th November 2009. *** The wedding of Arun with Ajeeta in Gurgaon was a very grand event. Over 30 relatives from all over India gathered in Gurgaon for the occasion. Barat in North Indian style was on the evening of 8th November was a very grand affair. The traditional South Indian Muhurtham was in the morning of 9th November. Hats off to Ravi and Urmila for the excellent arrangements for the Muhurtham as well as the boarding and lodging of relatives and friends in South Patio, the club house of Unitech which was of 3-star (or more) standard. They had also arranged over a dozen vehicles to pick up /drop back every one from the airport/railway station/homes. Radha has written in detail about the wedding in her article All about Arun's wedding - A photo essay . Amritha and I had gone from Chennai by Tamil Nadu express and returned to Bangalore from there by Rajdhani express. Overall it was a very enjoyable four days outing for us. *** Vanaja (my sister) is unwell and could not attend her grandson's (Arun).wedding. Naturally she could not attend Shubha's Ayush Homam. So we had taken Shubha to her house to get her blessings. Here are 3 photos taken in her house. *** Vijaya (my sister-in-law) travelled alone from Bangalore to Delhi and back by flight for Arun's wedding. As I said last time, her achievement is a tribute to her own courage and to the skills of Dr.Jayashankar, ortho-surgeon who replaced her knee-cap two years ago. *** My brother Raghu had to suddenly undergo a cataract operation in September in one eye. As he had to undergo a check-up for the other eye also, he could not visit Gurgaon for the wedding. He is now fully fit. My sister-in-law, Kalyani (as well as Rukku and Hema) were among the 3000 people who had gone on a religious tour of Pancha Dwaraka, Kurukshetra and Mathura with Velukkudi Krishnan. *** As I mentioned in the last issue, Prasad and Rupal are spending their time travelling and changing houses. Amritha and I visited them in Mulund, Mumbai in August. I spent a night with them as I was going to Vadodara for a lecture. Amritha spent two nights in their flat. They are both excellent hosts. They will be staying in our flat in Chennai when we are away to Australia. As editor of the Newsletter, I am happy since Prasad has written about his stay in Mumbai. I hope he will write about Chennai for the next issue. I am a regular reader of his excellent blogs, the links to which are given here again. *** Chooda and Kannan were perhaps the first relatives from our side to visit Santhanam in Hyderabad for a few days. They spent their time on visiting places of pilgrimage in and around Hyderabad. *** Rukku and Hema were among the 3000 people who had gone on a religious tour of Pancha Dwaraka, Kurukshetra and Mathura with Velukkudi Krishnan. The trip seems to have been enlightening, though tiring. Hema has also undergone Samashanam and Baranyasam which makes her a true Sri Vaishnava. 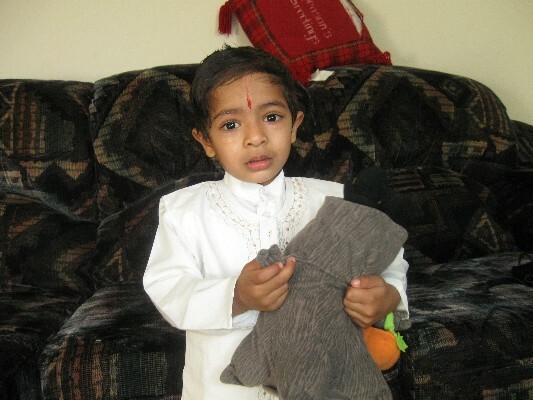 *** Pushpa's grandson, Sriram talks a lot and is growing up to be a naughty (and cute) boy. 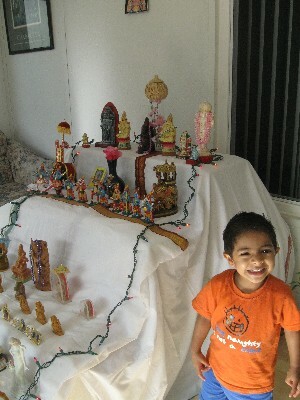 Shoba has sent some photos of her golu as well as Deepawali. A few are here. *** Radhika seems to be enjoying her stay in Jawaharlal Nehru University, Delhi. We were pleasantly surprised when she attended Shubha's Ayush Homam. 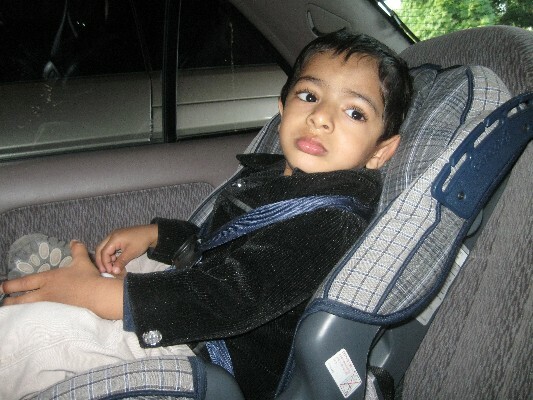 *** Raghu (of Sydney) was hospitalised for a few days in August with a suspected heart condition. Fortunately the angiogram showed that his heart is fine (as we all know). He was discharged from the hospital after a few days. We are looking forward to our visit to Sydney. Vidya and Nitya have uploaded "Laila Majnu" , the musical play staged by them in Youtube and we have seen the play. It was excellent. Amritha wrote to Vidya and Nitya after watching their performance,' I could finally see all the six parts yesterday and what a performance it was. We have all seen Vidya's dances, but Nitya, you were a revelation. The grace and elegance in your dancing was amazing. Congrats and keep it up. The next issue will be published on 25th January 2010 after our return from Australia. Bye. தொட்டி மாறிய 234 வருட தொட்டிப் பனை!